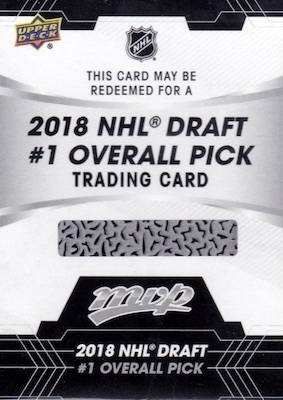 Celebrating 20 years in the hobby, 2018-19 Upper Deck MVP Hockey again marks the beginning of the new NHL collecting season. 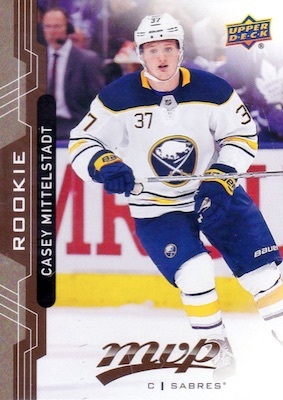 The early-year release maintains its reputation as a moderately-priced set that offers top incoming rookies via redemption cards. Issued later, there is also the 2018-19 Upper Deck MVP Factory Set with exclusive cards. 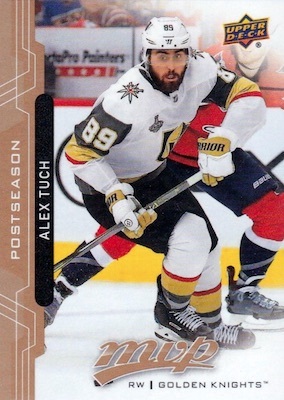 Similar to 2017-18, the 2018-19 Upper Deck MVP Hockey checklist brings a 250-card base set that includes High-Series Base Short Prints at 1:2 packs. There are also Silver Script (6 per box) and Puzzle Back parallels (5-6 per box), plus low-numbered Super Script (#/25) and Black Script (#/5) versions. Gold Script parallels, numbered to 150, are Blaster exclusives. 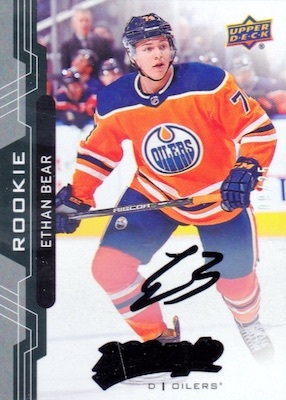 Kicking off the '18-19 NHL rookie class, 2018-19 Upper Deck MVP Hockey features the normal Division Rookie Redemptions sets for notable first-year players in the Atlantic, Central, Metropolitan, and Pacific Divisions, and the rare 2018 #1 Overall Draft Pick Redemption cards. The rookie redemption cards average one per case. Honoring the anniversary of the UD brand that began in 1998-99, the 20th Anniversary Silver Script Tribute set features 100 cards that combine to average 1:5 Hobby packs. Utilizing Spectrum Light FX technology, the Colors and Contours die-cuts include parallels like Gold (#/198) and Purple (#/8) for the full insert line. 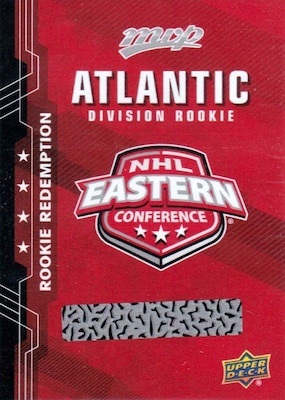 Falling three per box, NHL Player Credentials cards mimic the look of an ID card. 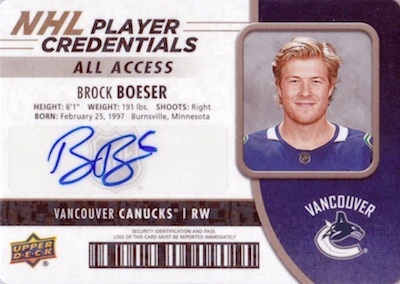 The insert set includes Autograph editions that act as a case hit. 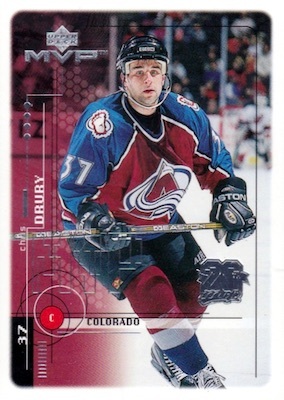 In addition, there are special stamped Buybacks from 1998-99 Upper Deck MVP. Each buyback is numbered to 20 copies. Odds Key: H = Hobby; e = ePack; R = Retail; B = Blaster; F = Fat Pack. 250 cards, including 50 High Series. Shop base sets on eBay. High Series Odds - 1:2 Hobby/ePack, 1:4 Retail/Blaster, 4:3 Fat Pack. PARALLEL CARDS: Silver Script (1:3.3 H, 1:2 e, 1:7 R/B, 1:3 F), Gold Script #/150 (Blaster), Super Script #/25 (H/e), Super Script Black #/5 (Only High Series; H), Printing Plates #/4 (H/e). Factory Set - Full details. Odds - 1:4 Hobby, 1:7.5 Retail/Blaster/Fat Pack. 4 redemption set cards; 8 cards per set; 32 cards overall. Shop rookie redemptions on eBay. Odds - 1:400 Hobby/ePack, 1:4,000 Retail/Blaster, 1:960 Fat Pack. 1 card. Shop rookie redemptions on eBay. Odds - 1:1,250 Hobby/ePack, 1:12,500 Retail/Blaster, 1:3,000 Fat Pack. PARALLEL CARDS: Gold (1:12,500 H/e). Odds - 1:5 Hobby/ePack, 1:10 Retail/Blaster/Fat Pack. PARALLEL CARDS: Gold Script #/150 (Blaster). 100 cards. Serial numbered #/198. Hobby/ePack only. Overall odds - 1:267 Hobby/ePack. Unannounced insert. Let us know if you spot any others. Shop on eBay. 220 cards. Serial numbered #/20. Hobby only. View the 2018-19 Upper Deck MVP Hockey checklist spreadsheet. 1 Star. Entry level?, moderately priced? There are nearly one thousand cards in this set. So what is that at $50.00/box? I assume that upper deck still considers kids as possible customers. As a collector on a budget MVP is a staple to grab early affordable rookie cards. This years design is far cleaner looking than last seasons dark and busy look. 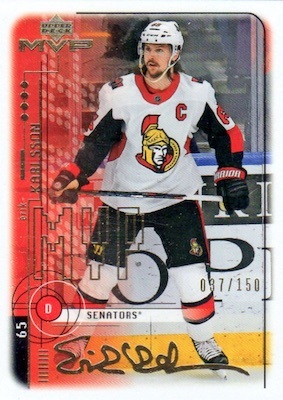 It would be nice if Upper Deck would simply release a series 2 instead of making collectors search for hard to find redemption cards for the draft picks. 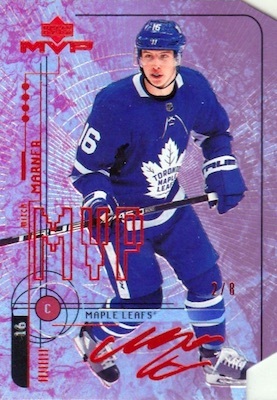 Well at least they brought back Parkhurst and regular numbered OPC high series cards for the budget and younger collectors. I would like to see the return of Collectors Choice or Victory to add some more choices for budget sets. Nice early season product. Price is good and yet there are still some decent hits possible. Always enjoy any issue with the SP High Series, gives us collectors a little something to chase. Not too keen on collecting puzzle cards and only 1 colors and contours this year is a real bummer. Beautiful product. A real improvement from the previous years. First of all, the stamped buybacks, very common with baseball cards, are sweet! I also like the 20th Anniversary Silver Script and Colours and Contours. A nice way to commemorate 20 years of existence for the first set of the new season. Second of all, I really like the fact that there are no more parallels for the Credential Access subset. Last year every card had Levels 1, 2 and 3. Honestly, there was barely any physical difference amongst them. The way they presented it this year is much more nicer and easier to collect. But, in my opinion, the best improvement is the Colours and Contours subset. I couldn’t stand the billion of odds and three types of colours for everyone of the 4 levels from the previous years. In the end nobody cared about those odds anymore, unless the player was very good, and the cards worth the same, regardless of the level or colour. With the introduction of a serial number and by removing all those odds, levels and colours, the subset became very attractive. Definitely a 5 stars for me. A clear, simple, nice design collection. I hope this is the preview for what we are to expect from UD this season! William Karlsson is Postseason #7. Intrigued about the printing plates. Anyone know how many colour variations there are? I think I see blue, black, yellow and magenta? Yep, it’s usually the same four colors anytime there are printing plates: Black, Cyan (Blue), Magenta, Yellow. They are each 1/1 with four in total. Yes, of course they did. It has always been like this. The short prints are usually the most famous players and the rookies. That’s MVP and it’s not new. I don’t see why would that be a problem. There are many many collections where the stars of the NHL are not short printed. I love MVP, it was one of the first sets that I collected as an adult. The overall design this year is nice, although the buybacks aren’t my cup of tea as my team was not there (Winnipeg Jets), however, I wouldn’t cry if I pulled a Selanne. My unbiased rating is 5 stars, but my biased rating is 4 because they made Matthews a SP but not Laine. am i the only one to have pull a Marner all level acess auto whithout the autograph? they even congrats me for the autograph on the back of the card. Although I wasn’t planning on doing any MVP this year, I just opened a blaster and was pleasantly surprised. The base cards look a lot better than the ones from the last couple of years. The two retro Silverscripts and one Goldscript “etched” facsimile autos look great. The four Silverscripts look a little corny, as if someone spray painted a black swatch for the player to “sign”, but at least you can clearly see the silver facsimile auto. The blaster also had one of the Player Credentials ID cards, three Puzzle backs, several SP vets and rookies, and a lot of base. The MVP cards are not fancy but they can be fun to actually trade if you are interested in building any of the various subsets. I’d give it 3.5 stars but I can’t and so will round up to 4. The cars is nice this year and more set to complete. Going through my cards, I found a Joe Pavelski 25th anniversary GOLD SCRIPT 108/150. Anybody else has found one ?